After all the feedback I received from the lovely denizens on Ammobunker, I went back to my spyrers and reworked them. 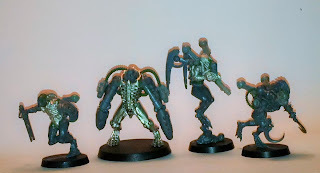 The heads have been completely redone, with face masks from the Dark Eldar Wracks replacing two of them, and two bare heads from the Space Marine Tactical Sprue replacing the other two. I was never happy with the first version of the Yeld, so I completely remade it and I'm much more satisfied with the result now even though it's far removed from the original description. The other point of contention were the feet, with some suggesting that they be rounded off, but after much consideration, I decided to leave them as they were. 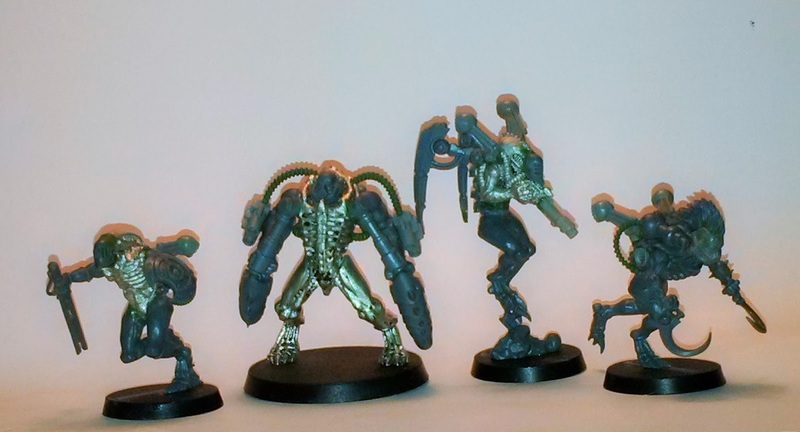 The only thing missing from them now is some mechanical sockets to be sculpted onto the Orrus's legs.